Books and Crannies is located in an old movie theatre which was built in 1925. 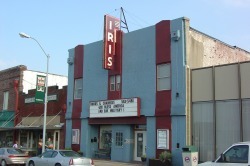 "The Iris Theatre" operated continuously until it's final show in 2001. We renovated it into our bookstore, but kept the flavor and the feel of the old theatre. We also have a small theatre in the back of the store where we show classic movies and where our theatre troupe, The Vagabond Players, perform live theatrical presentations. Our goal is to have a place of peace in a busy world where our customers can enjoy a quiet time in our reading area with a good book, or a visit with our staff - Gayle, Hannah, Brenda and Mollie, our resident bookstore kitty. We sell used books, new books, and gift items. We order new books every week, and will be happy to order any book you are looking for. New books normally are discounted up to 15% off retail with no shipping charge. If you are looking for an out of print book, please let us help you find it! We take your gently used books in trade, and will offer you a store credit to use to 'purchase' used books that we have in stock in the store. With close to 100,000 used books in all genres, you are likely to find something you can't live without on our shelves! We are also the exclusive Terrell distributor of Susan's Soaps and More - an all natural line of skin care products handmade in Scurry, Texas. Susan's soap scents are nothing short of delectable, and the salt glows can help solve a myriad of skin problems. And with Skin Serums for every skin type, and lotion bars that smell good enough to eat, Susan has developed a complete line of skin care products. Also located in the Iris Theatre building is Gayle's newest venture - Silhouette Ladies Resale Boutique. Check out the "Silhouette" page for more information on this shop. Stop by and visit soon - we would love to meet you!